Anders Wijkman is Chairman of Climate-KIC and former MEP; and Catia Bastioli is CEO of Novamont, a world leading group in the development and production of bioplastics through the integration of chemistry, agriculture and the environment. The President of the European Commission Jean-Claude Juncker, recently addressed the European Parliament on the future steps to implement the EU Action Plan on the Circular Economy. That is, indeed, welcome. The snail pace so far in terms of implementation – not least the reluctance to impose design requirements for products put on the market – has been embarrassing. Among the initiatives, the Commission is working towards a goal that all plastic packaging on the EU market will be recyclable by 2030. In 2015, with more than 20 Ml tonnes/year of plastics in the EU, packaging represented almost 40%. Scarcely 26% of all plastics are recycled in Europe. The question is what to do about it? Would recycling the conventional way really be a good solution? Most Europeans do some form of recycling. They separate paper from plastic, glass and metal and they might put food residues in a bin destined for composting. Many people advocate EU measures such as deposit refund schemes to further boost recycling, reduce littering and plastic pollution. Plastics unique properties make them a useful alternative to other materials. Yet, plastics can take hundreds of years to break down and have been turned into the most common pollutant of ocean waters. Their composition and properties are diverse which makes a comprehensive recycling of plastic residues basically impossible. Without a radical rethink the best we can hope for is that enhanced recycling of everything from plastic water bottles to yoghurt pots will be downcycled into other low-value products, such as doormats, textiles, plastic lumber, etc. In this situation we must ask if the effort to make all plastic packaging recyclable would be really feasible. Most of the plastics will still end up in an incinerator or in a landfill, shifting the environmental burden to the atmosphere or to the soil while not reducing the demand for more virgin petroleum. What we need instead are standards – to limit the number of different plastic qualities – and separate collection systems for the main qualities. In essence this means we have to rethink the whole system. 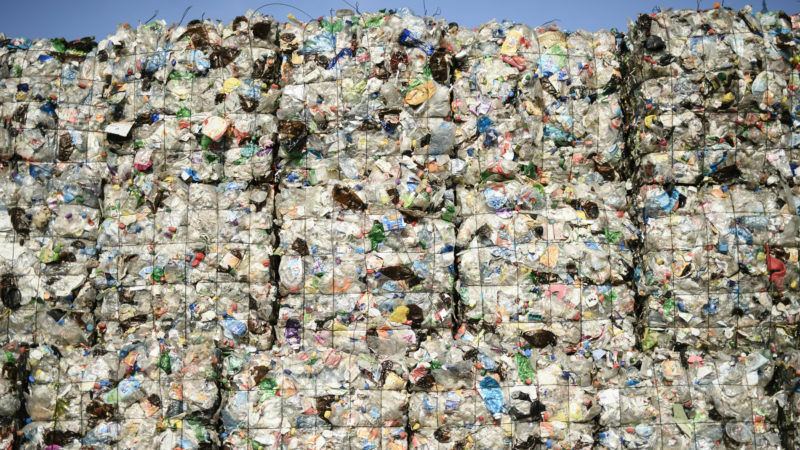 The focus hitherto on enhancing recycling rates – without separating high-quality plastics from poorly designed, low-value products – has been hampering innovation. The aim should be the development of effective industrial systems where all parts – from their conception and design to their use and regeneration – contribute to the wellbeing of the entire system. Calls for further increasing EU recycling rates for plastics should therefore be based on an assessment of the complete plastics value chain with the aim to improve eco-design for certified plastics in priority applications, increase demand and thereby collection of certified recycled plastics, mandatory schemes for separate collection of bio-waste. Biodegradable plastics should preferably be used in food packaging and hence be easy to collect as bio-waste. It should not be mixed with plastics aimed for recycling. Standardisation and clear policy objectives provide the ideal toolbox to rethink and redesign a sustainable plastics value chain. Standards should be the result of voluntary cooperation between industry, public authorities and civil society collaborating, based on transparency and consensus. The imperative to “recycle more” will be effective only if industry, governments and advocacy groups join forces to build a “plastics system that works”. The implication would be the changing of an economic model that thrives on wasteful products and packaging, and leaves the associated problem of clean-up costs to local communities. It would entail building an alternative to the traditional linear economy by developing a portfolio of products, preferably based on locally available resources, that would aim at closing the loops. More than 2/3 of the 96 M/tonnes of bio-waste generated in the EU are still landfilled resulting in a grave loss of resources for organic soil improvers, fertilisers, growing media component. All these secondary, non-toxic products can replace fossil-based products such as mineral fertilisers, lubricants, peat and fuels. After use, their residues can flow back safely into the biosphere, thereby closing carbon and nutrient cycles. It is estimated that a EU policy aiming at zero bio-waste in landfill – or in incineration – would generate about 50 M/tonnes of CO2 savings; €10 billions of investments in territorial development and tens of thousands of jobs. Thanks to the development of the bio-plastics supply chain, Europe already produces a number of innovative products within world-class systems. There is a range of new integrated technologies ready for scale-up if only the EU did play its role to promote models by developing relevant standards, advocating for proper GPP (Green Public Procurement) implementation by member states and providing a regulatory environment to boost specific bio-plastics applications.